Would you like some Flash drives with that, sir? Students at Eastside Preparatory School in Kirkland, Wash., are getting class materials in a new way this year: on a tiny flash-memory drive that plugs into a computer’s USB port. Small enough to wear on a necklace, this “digital backpack” can hold textbooks, novels, plays, study aids, the dictionary, graphing-calculator software — almost anything, really. 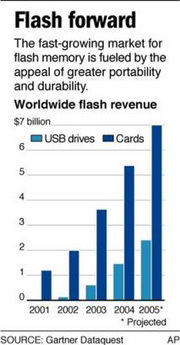 Falling prices in computer memory have made these little flash drives — also called pen, thumb or key drives — into enormously powerful tools that are on the verge of changing the concept of “personal” computing. With a gigabyte of flash memory now available for less than $100, these inexpensive digital storehouses can hold not just important data but also entire software programs. The information they carry can be encrypted and accessed speedily, a benefit of faster microprocessors. What this all means is that computer users are no longer at the mercy of the machine that happens to be nearby. Everything we need to interact with computers — even down to the appearance of our home PC’s desktop — can be carried with us and used on almost any computer. A few years ago Jay Elliot was looking for a way to help doctors move medical information securely and decided that flash memory — which has no moving parts, unlike hard-disk storage — was the perfect solution. But as memory prices kept falling, he realized there was room for more than just data. So he invented Migo, software that lets removable storage devices such as USB drives and iPods essentially function as portable computers. Plug a Migo-enabled device into a computer and enter your password, and a secure session launches in which you can send and receive e-mail and work on documents, with the background desktop and icons from your own PC rather than the ones on the host computer. When you’re done and remove the drive, all traces of what you did are removed from that computer. The next time you plug the drive into your home computer, data on each are synchronized. From the BBC – President George W Bush told Palestinian ministers that God had told him to invade Afghanistan and Iraq – and create a Palestinian State, a new BBC series reveals. In Elusive Peace: Israel and the Arabs, a major three-part series on BBC Palestinian Prime Minister Abu Mazen, , and his Foreign Minister Nabil Shaath describe their first meeting with President Bush in June 2003. VoIP is a natural threat to the voice business of fixed operators. They are already severely under threat by new discount service providers in the long distance and international call business; the entries of cable TV operators into the voice telecoms business; and the migration of younger customers away from any fixed wireline phone connection whatsoever. VoIP will be the final nail to their coffins. “Pure” mobile operators are actually the most insulated from cannibalization of VoIP. We have had 100% ability to use VoIP on mobile phones since 1998 when the first Nokia Communicator was released, and no such threat has materialized. For the very reason I explained above: that any “free” VoIP service on a mobile phone will still incure usage charges on the “data” side that totally wipe out any possible “savings” gains from the VoIP calls. Look at your own “internet” service on your mobile phone or laptop modem card – you are charged per megabyte or by minute, or if not, you have a monthly limit of how much “fair usage” you can have per month. There is no such thing as free internet on the mobile network. There is a natural resource scarcity that guarantees this.